There have been many goings on recently. There’s actually been so much, that I haven’t had time to attend properly to this blog, like I wanted. But busy is good. 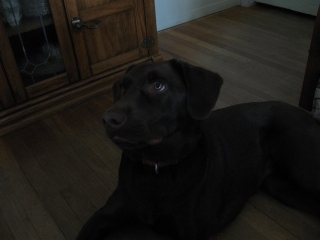 As I’m sure you can tell, she is a chocolate labrador retriever, recently turned one-year old. So she is still a puppy but in a full-grown body. Her favorite activities include sleeping on people’s feet, sniffing crotches, and playing keep-away in the backyard. She even has her own Twitter account: @mollybrownnyl. She has been occupying a lot of my time lately. I recently moved out of my Santa Monica apartment and am on my way to living in Venice for a while, but for a short time I’m staying with my parents in the San Fernando Valley to help them out with Molly (she’s their puppy). My mother recently went through major neck surgery, and with a rambunctious full-grown puppy around, it was a concern about her being able to take care of Molly the way a puppy needs during the day, as well as if Molly could get too rough with her while she’s healing. So, I’m staying with them to puppysit while my mother heals. My mother is actually doing very well so far, by the way. However, this along with my job hunting has been taking up most of my time. This means that I will not achieve my goal of completing my novel, Payroll, by my birthday, which is in less than a week. I’ll have to give myself some other arbitrary date in the near future for when I will have it done so that I can once again miss my self-imposed deadline. Now, if you’ll excuse the short update, I have a brisket in the pot to make my corned beef and cabbage recipe.